That wars let loose events never contemplated in times of peace is a commonplace. It was as true of the Boer War (1) as of World War I (2), though on a smaller scale. The bitter, Boer conflict which ended with the Treaty of Vereeniging (3) had stirred emotions that must find an outlet—either that of enduring hostility and revolutionary unrest between the [Boers and British colonists], or that of friendly relations and the building up of mutual confidence. It was to promote the latter rather than permit the former that led the British Government, when the new Crown Colony Administration of the Transvaal was set up in 1902, to refrain from repealing the anti-Indian legislation of the South African Republic, notwithstanding that British official spokesmen, in 1899, had declared that this form of racial intolerance was one of the direct causes of the Boer War! Racial discrimination against non-whites had been fundamental, from the earliest days of the Republic, but now could no longer be ignored. Yet it was some time before the defeated Boer leaders could be persuaded that Britain was in earnest in desiring to extend democratic self-government at an early date. Apparently, the main basis upon which the British-Boer edifice could be built was the recognition that the non-whites were to be excluded from the franchise and from such major citizenship rights as those of trade, residence, and land-ownership otherwise than in segregated areas. Among the non-white community, the most intelligent and prosperous, and the best organized, were the Indians, mostly Muslim traders from Western India; they were already strongly influenced by the Indian national movement. The status of the Indian community, from its beginnings in the Transvaal had been degraded by the fact that the much larger Indian population of the neighbouring colony of Natal was derived from indentured labour immigration. It was a matter of ‘herrenvolk’ (indigenous whites), on the one hand, and of ‘coolies’, on the other. This was the situation facing Gandhi after the Boer War. He realized at once that the centre of gravity of Indian affairs had passed for the time being from Natal to the Transvaal. If the widespread denial of rights in the new Colony were not to spread to Natal, where most of the South African Indians had settled because of the immigration laws of the other three Colonies, immediate steps must be taken to stem the flow of legislation based on race, and of the administrative restrictions being threatened. The government’s newly formed Asiatic Department, however, was unfriendly to the Indian community from the first. It sought not only to prevent fresh immigration, but also to exclude the return of pre-War residents. As a conciliatory measure, and upon the highest official assurance that this would be the final requirement for residency, the Indian leaders, on Gandhi’s advice, agreed to restrict immigration. Also, the £3 residential certificates, issued by the Boer Government, would be voluntarily surrendered and replaced by new certificates guaranteeing the rightful holders residency. A census taken in 1901 showed that, as against a pre-War figure of some 15,000, the Indian population had been reduced to 10,000. Possibilities of better economic conditions had drawn some of those formerly living in outlying areas to the new prosperous city of Johannesburg. But they were compelled to reside in an overcrowded ‘location’ grossly neglected by the Municipality. When, presently, an outbreak of plague occurred there, due mainly to neglect, the Indian inhabitants were removed and the ‘location’ destroyed by fire. Many of these who had lived there now had to seek refuge in outlying towns and villages. A general impression was deliberately being fostered, by the anti-Indian European leaders (anxious to get rid of trade rivals), and by some of the officials of the Asiatic Department, seeking to divert attention from their own defects and malpractices, that widespread illicit Indian immigration had taken place, in which the Indian leaders had connived. At about the same time, the Transvaal gold mines and the Orange Free State Railway were in great need of skilled and unskilled labour and sought—as had happened 45 years earlier with the estate owners of Natal—to secure indentured labour from India, whose Government, under Lord Curzon, would not consent because of the refusal by the colony of South Africa to offer the Indian workers due legal rights and protections. Immediately upon his return from participation, as Sergeant-Major in charge of an Indian volunteer stretcher-bearer unit, in the Natal Native Rebellion Campaign of 1906, Gandhi found himself and his people in the Transvaal threatened with a draft Ordinance requiring all Indians (including women) to surrender their registration certificates, in breach of the official pledges only three years earlier that had guaranteed these, and to apply for fresh registration requiring new details of identification, including a full set of fingerprints. It would be a humiliation to the Indian Motherland, which could not be tolerated. Nonetheless, Gandhi’s method was always that of conciliation and negotiation where possible. The Colonial Administration, however, refused to negotiate with the Indian community and forced the measure through the Legislature. As it could not come into operation without the Royal Assent, Gandhi, as leader of a small deputation, was sent to England to prevent this, and eventually succeeded, largely with the help of prominent retired officials from India, and especially Lord Ampthill, the former Governor of Madras and then acting Viceroy. In the meanwhile, steps had been taken, by agreement between the British and Boer leaders, to establish responsible government in the Transvaal, and it became operative in 1907. The first piece of important legislation, rushed through all its stages in the newly elected Legislative Council by the Government of General Botha (General Smuts held the portfolio of Asiatic Affairs), was the very measure which had already been rejected upon the advice of the Colonial Office. Now, however, in spite of Indian protests, it was found impossible to interfere with a Colony enjoying self-government, and the Bill became law. Accordingly, the oath taken by the Indian community to resist any loss of rights came into effect, and due notice to the Government was given of this dissent. These discriminatory circumstances were the reasons for the birth of the Satyagraha movement, which continued for the next seven years, with occasional suspension. General Smuts had this to say in his own defence: ‘I must frankly confess that his (Gandhi’s) activities at that time were very trying for me. Together with other South African leaders I was then busily engaged in the task of welding the old colonies into a unified State, of consolidating the administration of the new national structure, and of creating out of what was left after the Boer War, a new nation. It was a colossal work, which took up every moment of my time. Suddenly, in the midst of all these engrossing preoccupations, Gandhi raised a most troublesome issue.’ But that does not exonerate the distinguished South African statesman for those many times when he failed to fulfil his and his Government’s formal pledges to Gandhi and the Indian community, when politics triumphed over statesmanship. There is hardly any manifestation of the technique developed in later years that did not have its first expression in that long drawn out campaign. For Gandhi, Satyagraha meant something active and dynamic. It was the power of Truth that must prevail. Personal suffering on the part of Satyagrahis, endured in a spirit of nonviolence and even of positive love, involving, it may be, the martyrdom of individuals, must in the end appeal to the better conscience of the opponent and result in the removal of the injustice. In the course of his experience during those volatile years, Gandhi came to realize that he must renounce his legal practice, partly because of his unwillingness to earn a livelihood from a profession which resorted to force to maintain the decrees of the Courts; partly because he had already, under the influence of Ruskin’s Unto This Last, adopted the ‘simple life’ of the farmer and the craftsman; partly in order to devote himself entirely to the service of his people. At the same time, he renounced conventional family-life and adopted Brahmacharya [voluntary celibacy]. Four times a prisoner sentenced to hard labour, he wore the non-white convict’s headgear, which later became known as the ‘Gandhi Cap’. He was already, largely in consequence of Tolstoy’s writings on ‘Nonviolence’, a votary of Ahimsa as the weapon of the strong. He was encouraged in his view that imprisonment of the body left the spirit free by Thoreau’s argument on the duty of ‘Civil Disobedience’, where a question of the citizen’s conscience was involved. The public burning of foreign cloth was anticipated by the burning of the voluntary registration certificates after Smuts’s repudiation of his pledge to repeal the Black Act of 1907. It was in South Africa, however, that Gandhi also refused, even under pressure by his colleagues, to extend the Satyagraha campaign to include previous injustices; he wished to restrict its scope to the particular objective and thus secure the removal of the special grievance with the minimum of suffering and sacrifice. Except where the masses were directly concerned, as in the case of the £3 tax, and they could be assured of effective and disciplined leadership, he refused to countenance mass agitation, limiting the activity to the individual Satyagraha of chosen followers and well-tried associates. Gandhi’s famous fasts had their origin in his first fast in South Africa, for self-purification, and by way of penance for the sins of others. Even his renunciation of cow’s milk took place there in order to free himself from the lower passions. Renunciation, abstinence, continence, self-sacrifice—all derived from an urgent desire to practise the essential doctrines of the Bhagavad Gita—had their stimulus during the formative years of the Satyagraha campaign in South Africa. Even the murderous, assassination attack upon him that resulted in his death on 30 January 1948, was anticipated forty years earlier by a similar assault in Johannesburg by some misguided countrymen who had misunderstood his motive and action in setting an example to the Satyagrahis by applying for voluntary re-registration with the giving of finger-prints without legal compulsion, after General Smuts had undertaken to repeal the Act of 1907. All of these experiences helped to crystallize the character of the man who was to become the Father of Indian freedom and the greatest of his age. (1) There were two Boer Wars. The First Boer War was 16 December 1880 to 23 March 1881; and the Second Boer War was 11 October 1899 to 31 May 1902. There is a vast literature on both wars, with Wikipedia providing summaries of the current research. (2) World War I’s dates are: 28 July 1914 to 11 November 1918. (3) The Treaty of Vereeniging (more commonly referred to as Peace of Vereeniging) was signed on 31 May 1902, and ended the Second Boer War between the South African Republic and the Republic of the Orange Free State, on the one side, and the British Empire on the other. It provided for the end of hostilities, and eventual self-government, in the Transvaal (South African Republic) and the Orange Free State. A NOTE ON THE TEXT: This extract was first published in Viva Bharat Quarterly, Gandhi Memorial Edition, October 1949. The full text of Polak’s essay on Gandhi’s South Africa years, from which our extract is taken, is included in the anthology, H. S. L. Polak, H. N. Brailsford, Lord Pethick-Lawrence, Mahatma Gandhi, London: Odhams Press, 1949. EDITOR’S NOTE: Henry S. L. Polak was a London lawyer who immigrated to South Africa at the age of 21. 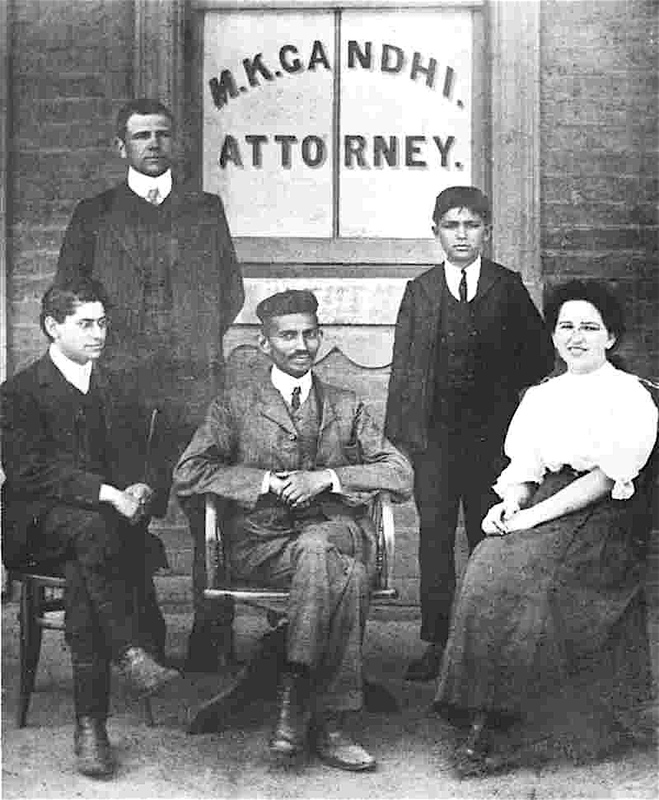 Upon arrival in Johannesburg in 1904 he found work on the staff of the newspaper, The Critic, the offices of which happened to be across the street from Gandhi’s office. Upon reading a letter to the editor Gandhi had written decrying the sanitary conditions of Indian laborers, Polak, greatly impressed, introduced himself to Gandhi. He later edited Gandhi’s journal, Indian Opinion and co-founded with Gandhi Phoenix Farm, an experiment in communal living. Polak is the author of Indians of South Africa (1909). The first, privately printed edition is hard to find, but a recent reprint is readily available: New Delhi: Gyan Books, 2015. See also the anthology mentioned above, H. S. L. Polak, H. N. Brailsford, Lord Pethick-Lawrence, Mahatma Gandhi, London: Odhams Press, 1949. Joseph Lelyveld’s biography of Gandhi contains an accurate and vivid picture of Polak, and his role in Gandhi’s life, Great Soul: Mahatma Gandhi and His Struggle for India, New York: Alfred A. Knopf, 2001; pp. 85-7. Lelyveld’s index entries on Polak are worth consulting, for further insights into Polak’s role in Gandhi’s life.